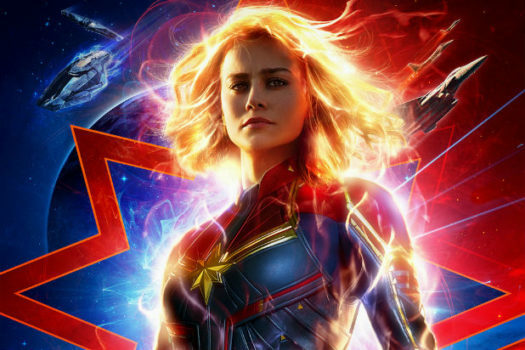 Fans of the Marvel Cinematic Universe (MCU) were ecstatic about the release of Captain Marvel when it hit theaters March 8, 2019. After the many rumors social media had stirred up after seeing Avengers: Infinity War, Captain Marvel had to live up to high expectations, and the film did not disappoint. Marvel Studios’ Captain Marvel focuses on Kree warrior, Vers (Brie Larson) who finds herself in the middle of an intergalactic war between the Kree and the Skrulls, two rivaling species from space. Set in the 1900’s, Vers has recurring memories of her forgotten life as U.S. Air Force pilot, Carol Danvers. With help from Nick Fury (Samuel L. Jackson), old friends, and unexpected allies, Captain Marvel unearths her secret past while discovering the true potential of her powers to end the war. Brie Larson, who played Captain Marvel, beautifully captured her character’s personality to create a believable performance. Larson jumped right into her role and was able to showcase both sides of Captain Marvel- the normal, sarcastic woman and the powerful superhero. However, Larson wasn’t the only actor that pulled off an entertaining performance. I was impressed with Samuel L. Jackson’s portrayal of Nick Fury. In watching Captain Marvel, I was able to see through Fury’s familiar hard exterior from past movies. Jackson did a spectacular job in showing Fury as a young man before he had turned into the cautious, no-nonsense agent he is known to be. Although I could predict certain events in the movie, there was a plot-twist that I was not expecting. For the most part, Captain Marvel kept me at attention. However, compared to some of Marvel’s most successful movies, I think that Captain Marvel doesn’t look as heroic. Nonetheless, it’s a great movie for superhero lovers. Captain Marvel left me in awe. The plot, the characters, and the music did an outstanding job at drawing the viewers’ attention. It’s a wonderful origin for the woman who is supposed to defeat Thanos in Marvel’s upcoming movie Avengers: Endgame.